Local, visiting, and resident artists need a way to connect with schools where they can have the greatest impact. Nadja Salerno-Sonnenberg, internationally acclaimed violinist and Resident Artist at Loyola University New Orleans, partners with Artist Corps New Orleans and Homer A. Plessy Community School. Produced by Loyola University School of Music & Fine Arts; Director: Maja Holzinger. See full film here. 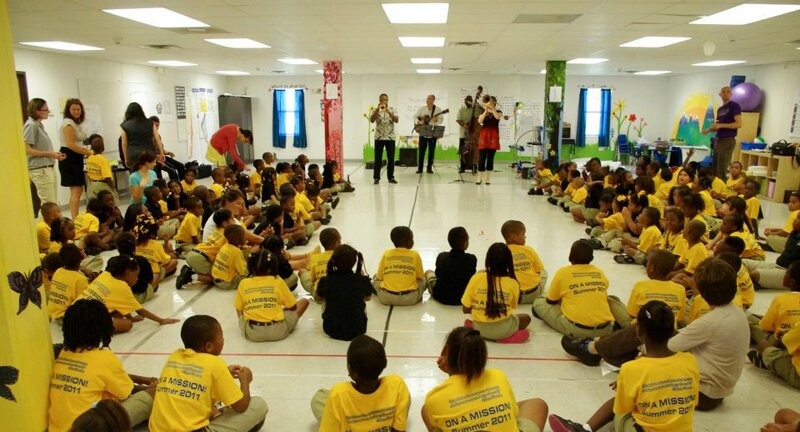 Committed to cultivating a spirit of service, Artist Corps New Orleans connects artists with opportunities to engage in volunteer outreach in local schools. This short video highlights our partnership with internationally acclaimed violinist Nadja Salerno-Sonnenberg, Resident Artist at Loyola University New Orleans. Gregory Perkins of the Creole Wild West Mardi Gras Indians demonstrates sewing and beadwork to students at Langston Hughes Academy. Leroy Jones, Todd Duke, Mitchell Player and Katja Toivola perform for local students. Anthony Reddix, member of the Creole Wild West Mardi Gras Indians, with Langston Hughes student Tyson Jones. Photo courtesy of The Times-Picayune. David Montana and Ausettua Amor Amenkum in a presentation of the "Mardi Gras Indian Experience" to local students. Artist Corps New Orleans also provides compensated outreach opportunities for our city's culture and tradition bearers – Mardi Gras Indians, social aid and pleasure club members, traditional and contemporary jazz musicians, and others – securing funding to pay these artists in support of our local cultural economy. We work with school faculty to integrate these experiences into the academic curriculum with authenticity and impact. For more information on outreach opportunities, please contact: info@artistcorpsnola.org. In our first initiative, Artist Corps New Orleans recruited, trained, developed and placed 11 Artist Corps New Orleans Fellows in 12 public schools, teaching 2,500 students in over 12,000 music classes.